Moon Sign or Lunar Ascendant - The Zodiacal Sign where Moon is posited in your sidereal horoscope. At the bottom of the webpage, we have given remedies or Astro Therapy for Moon Signs affected by an adverse Jupiterian Transit. Jupiter's Transits represent Vicissitudes ! Vicissitudes or changes in fortunes are part of Life. Life is cyclical and we find that fortunes fluctuate.In Astrology, this is symbolised by the Transits of Jupiter. In the Eleventh, he brings gains. In the Twelth, he brings loss ( Dwadase ravano hanti ). Whatever he has taken away when in the 12th and the 1st, he redeems and restores when he is in the 2nd. Similarly whatever he has taken away when in the 8th, is restored when he is in the 9th. So He is a redeemer and His transits are actually a blessing to mankind. Jupiterian significations like happiness, children, intelligence, intuitive capacity, mental peace, fame and prestige all will suffer as Jove takes an adverse stance. The significator of Finance turns malign & one feels that one is going through the fiscal purgatory. Mental peace takes a beating & there will be a dearth of happiness. Expenditure spirals beyond expectations. There may be misunderstandings with friends & relatives. This is the time when Lord Brahma lost his head meaning that even the greatest will have to face adversity during this torrid phase. This is one of the worst phases in one's life and one feels that Life is full of thorns. But then, no roses without thorns, no Crown without cross, no gain without pain & and no Heaven without Hell. ( Sthithi Nasam ) . Problems in the professional sphere have to be faced. The jealous amongst your competitors or rivals will use this time to spread rumours about you. You need not be unduly perturbed by their machinations. Remember the adage " War, the countersign; Victory, the word divine ". As Jove takes a favorable stance, Jupiterian significations will increase. Jove's significations are happiness, children, intuition, creative intelligence, mental peace and spiritual progress. Jupiter becomes benign as he is posited in the 2nd. As he is the significator of finance, prosperity will increase eightfold. Gains in education as the 2nd represents education in horoscope vedic. You gain a lot of friends. You are extolled for your virtue and your reputation increases. There will be a strong urge from within to pursue intellectual pursuits & to amass knowledge and Wisdom & also to move away from the madding crowd. Temporarily at least, the positive aspect in you will be more predominant. ( Vitha Samruddhim ) in Astrology Vedic. This is an unfavorable period for you as the planet of Wisdom turns malevolent & hostile in the adverse First. Uncontrollable expenditure, health hazards & unnecessary wanderings and journeys involving wastage of time & money indicated. All sorts of afflictions, financial & physical will visit you in Astrology Vedic. Melancholy marks you for her own as problems overwhelm you. Dissipation of wealth. This is the time when Lord Rama when to the forest. ( Janma Rama Vane Dukham ). Even emperors take to alms during this phase. ( Nana Dukham ). In the malevolent 12th, Jupiter turns malign & many problems you will have to encounter in mundane life. Expenditure spirals beyond control. You have to be careful while handling money. Children also may pose problems as Jove is the significator of children. Jovian significations are children, happiness, intuitive capacity, creative intelligence and faculties & spiritual progress This is the time when Ravana lost his head indicating that even the mightiest can be defeated by an adverse Jupiter. ( Dukha Bhayam Yachhati Jeeva ) in Astrology Vedic. This is an ideal time for speculation as Jove turns benign and prosperity can be had if you are ready to take a few calculated risks. Financial and educational gains indicated . Jovian significations like happiness, children, intuition, creative intelligence & spiritual progress increase. Also your financial assets will increase. And so will goodwill & reputation. Your merits will be extolled. Whatever Jupiter had taken last year will be given back to you. If you speculate, you may come up with flying colours. Monetary windfall can be expected from the stock market & jackpot. ( Sthana Prapthim ) in Financial Astrology. Impediments in profession. Loss of position and wandering about. Misunderstandings increase as Jove takes an adverse stance. Jupiterian significations like happiness, children, intelligence, intuitive capacity, mental peace, fame and prestige all will suffer as Jove takes an adverse stance Financial tightness looms large on the horizon. Be careful about spending money. Unnecessary expenditure take its toll of your purse. There may be problems in the professional sphere. Jealous people in the realm of profession may take this time to attack you and create problems. This is the time when Darika was killed meaning that 10th Jove can bring in loss of position and wealth . ( Dhana Hanim ). So, from the perspective of Financial Astrology, this transit is adverse. The financial planet turns benign and ushers in a prosperous period. There may be educational and financial gains. 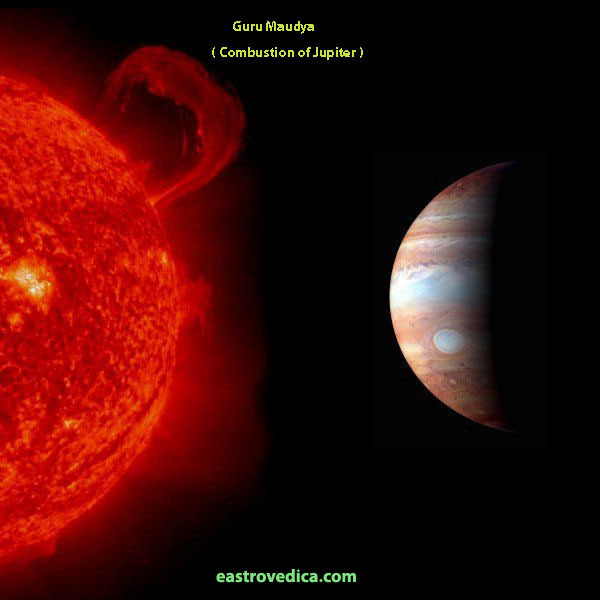 You will get relief from last years' eighth Jupiter. As Jove takes a favourable stance, Jupiterian significations will increase. Jove's significations are happiness, children, intuition, creative intelligence, mental peace and spiritual progress. This is the ideal time for Meditation and to enjoy the bliss of the Self. Your merit and good deeds will be appreciated by the multitude. More happiness from children and financial gains indicated ( Vitha Sukhapthim ) in horoscope vedic. Impediments to progress loom large on the horizon. Jupiter is extremely malefic in the 8th. All sorts of hindrances and obstacles crop up in your path. You become melancholic as a result. Financial tightness and misunderstandings with loved ones. You become subject to the machinations of your enemies. It will be in your interest to avoid arguments & unnecessary speculation. This is not the ideal time to speculate. Also be careful in handling human relations. This is the time when Bali fell indicating that even the mightiest can fall due to Jove's adverse stance. ( Ashtame Haritho Bali ). Wear Jupiterian amulet ( Brihaspathi Yantra ) to safeguard against malefic influences ( Rogan ), as Virgo will be adversely affected by the Jovian transit. Be careful about health also. The divine planet blesses you and this manifests as prosperity & happiness from children. Your merit will be appreciated by the multitude and you become the cynosure of all eyes. Educational gains and spiritual progress. As Jove takes a favourable stance, Jupiterian significations will increase. Jove's significations are happiness, children, intuition, creative intelligence, mental peace and spiritual progress. There may be gains in speculation. Goodwill increases. Your diplomacy will be appreciated by the public. This is the ideal time to strive for Self_Actualisation using Jnana & Bhakthi Yogas. The significations ruled by Jupiter, finance and progeny, get a boost and you become happier than before ( Bhogan ) and this is the time to enjoy life. The planet of wealth turns malign and blocks and barriers crop up. Progress is hindered by impediments. Financial tightness also makes its mark. There will be many misunderstandings with loved ones. Enemies find this a convenient time to attack. You will be upset by trouble from enemies as Jove transits the House of Enemies. ( Ripu Badham ). Jupiterian significations like wealth, children, ,mental peace, intelligence & general happiness are bound to suffer. Battling with barriers becomes a tough task and you feel that Life is Strife. This is the time when Maveli was bound indicating that the even the greatest can be bound by an adverse Jupiter ( Shashte Maveli Bandhanam ) , in horoscopes vedic. Problems attack you like a Hydra due to Jove's malign transit of the fourth. Barriers to progress increase as enemies try to block your progress. Loss of position and wandering about. You will have to recourse to remedial measures during this adverse phase. Jove is the Guru in the astrological hierarchy & he will compensate for the temporary setbacks when he transits Scorpio. This is the period when Pandavas lost their kingdom and went into exile, meaning that even the greatest can lose their position due to an unfavorable Jupiter. " Bandhu Klesam "- You may be tormented by relatives. The jealous amongst relatives will use this time to attack you and spread rumours about you. Domestic happiness takes a beating. Jupiter is the greatest benefic in the astrological hierarchy ( 1300 earths can be fit into Jupiter ) & his transit is indeed very important to the astrological fraternity. As he is the planet of Wealth, his transits can make or break you. He also represents children and happiness from progeny also depends on his favourable or unfavorable stance. You can chant his mantra, his Stotra, his Peedahara Stora & his Gayatri for optimum relief. Wearing Talismans or Amulets ( particularly Jupiterian Amulets like Brihaspathi Yantra ) can be very beneficial as it wards off the the malefic Jupiterian rays. Performing Jupiter Havan ( Brihaspathi Homa ) by 3 Brahmin scholars ( 3*336 Urus of the Brihaspathi Mantra before a Homa Kunda ) also imparts relief. Thursday is derived from Thor's Day ( Thor - Jupiter ). Thursday was consecrated to Jupiter. ( From the Latin Iovis Dies & the Sanskrit Brihaspathivar ) Yellow Sapphire is his primary gemstone & Golden Topaz or Citrine his secondary gemstone.